Springbok Casino was established in 2012 and it has quickly become one of the most popular gaming venues accepting South African players due to a reliable and stable software platform and a full range of casino games which can be played wherever you are. If you want to spend your free time playing casino games in a friendly environment without worries about converting your money into some other currency, Springbok Casino might be a perfect fit for your. As soon as you register with the casino you can make use of a R300 no deposit bonus you can claim by submitting the coupon code PLAY300 to try out the games which will provide you with the genuine casino experience. Read our comprehensive guide to Springbok Casino to get all the information needed to enjoy the gameplay to the fullest. If you own an Apple, Android or Windows mobile device, you can enjoy a wide range of casino games fully optimised for mobile play wherever you are. All the games available for mobile play perform smoothly on your handheld devices with all the features preserved in the transition, so there is no big difference if you play them on your desktop or mobile device. Being optimised for smaller screens, the games are rich in graphics and sounds and allow you to easily place your bets and control the gameplay. Besides dozens of slot machines including those delivering progressive jackpots, you can also take your chance on a number of table games and video poker variations on the move. All financial transactions can be carried out wherever you are so that you can enjoy your favourite titles as long as you have a stable internet connection. Running on the Realtime Gaming platform, which is considered to be one of the most reliable software in the industry, Springbok Casino offers the full range of games including all types of slot machines, video poker titles and classic table games which are the hallmark of each land-based and online casino. When it comes to slot machines, you can choose from a variety of themes and new titles are added on a regular basis. The games are available on the instant, download and mobile version of the casino. You can relax and enjoy all the fun and excitement in a fair and secure gaming environment as the gaming venue is tested and certified for the fairness of the gameplay and the security of all your data and transactions. 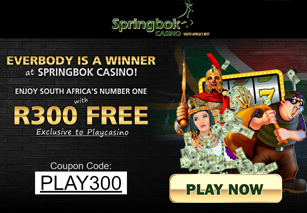 As a casino tailored exclusively for South African players, Springbok Casino offers a generous welcome package which includes a free no deposit R300 bonus which can be credited to your account as soon as you register with the casino. To get the free cash so that you can try out the games offered by the casino, you need to claim the offer by entering the coupon code PLAY300. The maximum cashout from this bonus is R500 and you need to achieve wagering requirements in order to clear the winnings obtained from it. You can also make use of the welcome bonus as high as R11,500 over your first three deposits. Springbok Casino also offers the loyalty program, special promotions such as a 300% match up to R600 bonus as well as promotions on a daily, weekly and monthly basis on specific games. You can also take part in slot tournaments which are available to players who play in the downloadable version of the casino. All your doubts or issues related to the gameplay or the casino policy can be easily resolved if you contact customer support available 24/7. You can reach them via toll-free line for South African players, live chat or email. All your inquiries will be answered in a timely manner by professional and friendly agents so that you can continue playing your favourite games as soon as possible. Springbok Casino offers a wide array of reliable and secure payment options you can use to make your deposits and withdrawals in ZAR. You can use them with no worries about your personal and financial data which will be protected by SSL encryption, an advanced security technology. Whether you use credit or debit cards, e-wallets, bank wire transfers or local payment methods, you can rest assured that your transactions will be completely secure. All your deposits will be instantly processed while withdrawals may take time depending on the method you use. Pending period for withdrawals might be between 72 and 96 hours long. The maximum withdrawal you can make on a weekly basis is R25,000, but over a few weeks you can be enabled to clear even higher sums. What do We Think of Springbok as a Whole? Taking into account all aspects of gameplay, it's no wonder that Springbok is one of the most popular gaming venues with South African players. Not only that you will enjoy the smooth performance of all the titles featured on the casino website wherever you are, but you can make use of various bonuses and promotions to play on the house and enjoy the gaming experience to the fullest. However, the most important thing about it is that you should not worry about the fairness and the security as the casino is trustworthy and safe to play at.